I’m back today with one last recipe for your Super Bowl spread. Just in case you haven’t finished your menu, you know. Not all of us plan weeks in advance. I’m just sayin’. And if you’re down to the last minute and need one more treat, this is a great one. It’s simple. Guys, girls and kids all love it and you probably have everything you need to make it in your fridge right now. 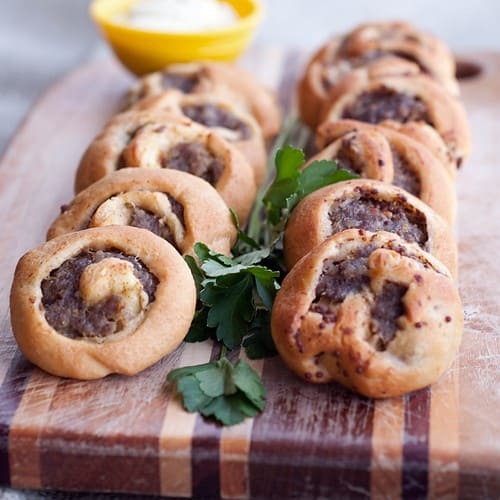 These little Sausage Swirls use three simple ingredients. Crescent rolls (yes, the whack-a-can kind), mustard and bulk pork sausage. You can also lighten these up very nicely by using the reduced fat rolls (they’re just as good as the regular) and a turkey sausage. Separate the rolls into four long rectangles. I was working with just two at a time in the photos. Spread each of the rectangles with your choice of mustard. I have made these with both a spicy brown mustard and a very grainy mustard. I prefer the grainy type but you use whatever you want. Then spread the sausage on top of the mustard. It’s much easier to spread if you let the sausage sit out at room temperature for 30-45 minutes beforehand. Now, roll each of the rectangles up lengthwise into a long cylinder. At this point, you can chill them covered until you’re ready to serve. Or if you have hungry folks standing in the kitchen waiting for these, go ahead and cut them into about 1 to 1 1/2″ pieces. Stand each piece up on its end and flatten it gently into a small disk. 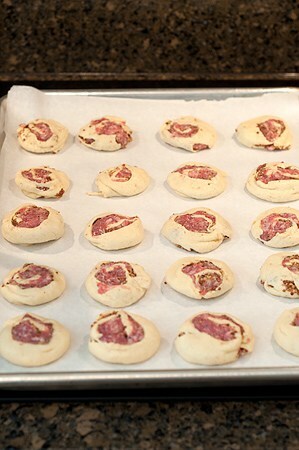 Place the swirls on a parchment lined baking sheet and cook for 18-20 or until golden brown. Serve hot. Serve with additional mustard to spread on each swirl. I sometimes make a dipping sauce with 4 parts mayonnaise, 1 part grainy or spicy brown mustard and a squirt of lemon juice. Spicy mustard and bulk pork sausage are swirled with purchased crescent rolls to make a fantastic appetizer! 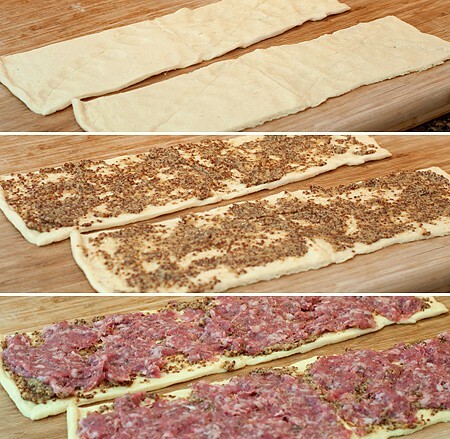 Separate crescent rolls into four long rectangles. Press perforations well to seal. Spread each rectangle lightly with mustard. 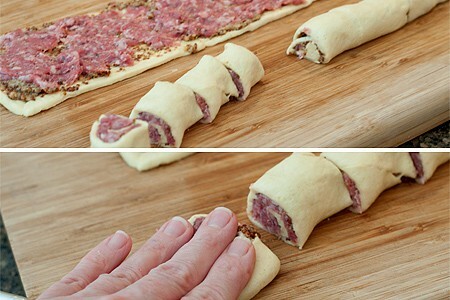 Divide sausage into four equal parts and spread a thin layer on each rectangle. Roll each rectangle into a long cylinder. Slice the rolls into 1” pieces. Gently flatten each slice into a small disk. Place on a parchment lined baking sheet and bake for 18-20 minutes or until golden brown. Suggested dipping sauce: Make a sauce with 4 parts mayonnaise, 1 part grainy or spicy brown mustard and a squirt of lemon juice. Serve alongside. I was wondering what to add to my Super Bowl menu (I have guests from Virginia, and want to make something different)……. Bingo! Hope you like it! Also try the turnip green dip from last week – it’s delicious! Those look delicious. I adore finger foods for game day. Me, too, Carolyn. I love having a whole plateful of different little bites. Oh yes – now this is Super Bowl appetizer bliss. I love how easy they are, too. Yes, definitely football food! And so easy. Love these, my mom makes something similar with prosciutto and they’re always gobbled right up! I’m so glad I found this recipe my grandfather would make these when we would take family vacations and I have been searching for the recipe for a few years now.